Dr. Alejandro Kovacs, board-certified periodontist, now offers custom sedation dentistry in Longview, TX, without a referral. 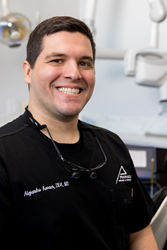 New patients with dental anxiety can now receive custom sedation dentistry in Longview, TX, from Dr. Alejandro Kovacs, with or without a referral. Dr. Kovacs is an experienced periodontist and prosthodontist who specializes in cosmetic, reconstructive and periodontal treatments. He seeks to help patients receive comfortable and relaxing treatment by offering IV sedation and other sedation options to those who have dental anxiety and fear. Dental anxiety is very common in the United States, and it is estimated that nearly 15 percent of Americans avoid visiting the dentist due to fear. Unfortunately, many patients with dental anxiety end up cancelling necessary appointments and compromising their oral health. Dr. Kovacs is a highly experienced periodontist who understands how important it is for patients with dental fear to receive preventative care and treatments for cavities, gum disease and other oral conditions. He offers custom sedation dentistry in Longview, TX, to help patients feel calm, relaxed and safe while receiving the oral care they need. Sedation dentistry is especially helpful for those who plan to replace their missing teeth with dental implants or who are preparing to receive a full mouth reconstruction. For cases like this, Dr. Kovacs offers deep IV sedation, which is administered intravenously and is highly effective. Patients under IV sedation not only sleep through the whole treatment but they also do not remember the procedure after it is completed. Dr. Kovacs warmly welcomes patients with dental fear and anxiety to visit his practice for sedation dentistry in Longview, TX. Individuals can easily schedule an appointment with the experienced periodontist by calling Pinnacle Implants & Periodontics at 903-758-3329 or by visiting http://www.pinnacleperio.com. Pinnacle Implants & Periodontics offers comprehensive periodontal care for patients in Longview, TX. Dr. Alejandro Kovacs is a Diplomate of the American Board of Periodontology, the American Board of Prosthodontics as well as the International Congress of Oral Implantologists. As one of only a few dual-specialized clinician in the nation practicing as a periodontist and prosthodontist, he offers cutting-edge services including dental implants, laser gum disease treatment, gum recession care and full mouth reconstruction. To learn more about Dr. Kovacs, his team or the services they offer, visit http://www.pinnacleperio.com or call Pinnacle Implants & Periodontics at 903-758-3329 to schedule a personalized consultation.